Hastelloy, a registered trademark of Hayes International, is a nickel-based alloy with high chromium and molybdenum. Hastelloy alloys exhibit high strength and excellent resistance to pitting, crevice corrosion and stress corrosion cracking. The properties of Hastelloy, much like stainless steel, are degraded by real world fabricating and handling operations. Electropolishing can be used to reverse these adverse effects and to improve the corrosion resistance of Hastelloy. Further details can be found in our discussion of electropolishing. The corrosion resistance of Hastelloy may also be improved by passivating the surface to remove contaminates which adversely affect its corrosion resistant properties. Harrison Electropolishing can mechanically polish Hastelloy and certify finishes as low as 4 Ra micro-inch. 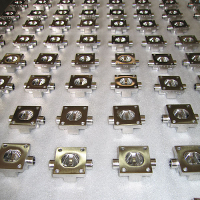 Harrison Electropolishing can oxygen clean and chemical clean a wide range of Hastelloy components. Contact us to discuss which service is best for your Hastelloy components.